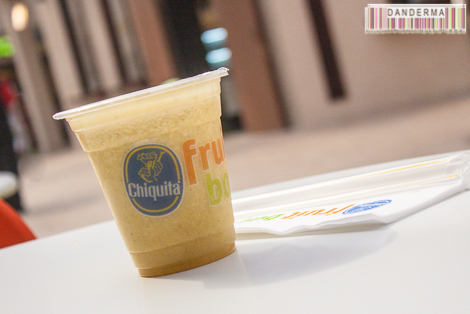 New stores and restaurants keep opening in the different new districts of the Avenues and one of the latest ones to open is the Chiquita Fruit Bar. 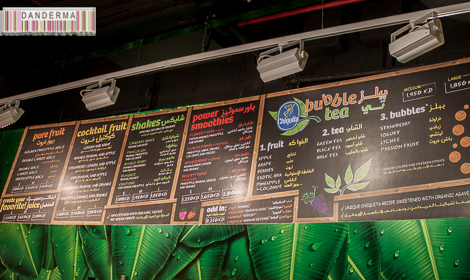 It’s located in the Souk district of the avenues mall. 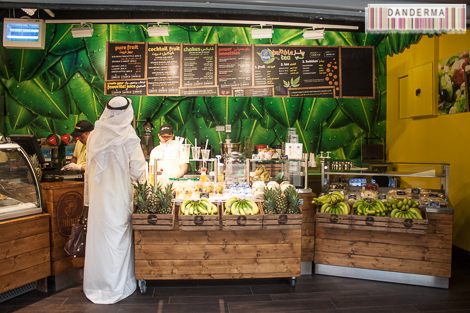 When I first saw their sign a few weeks back before their opening I thought to myself how different would this be from any other juice bar scattered around Kuwait? So I had to find out for myself. 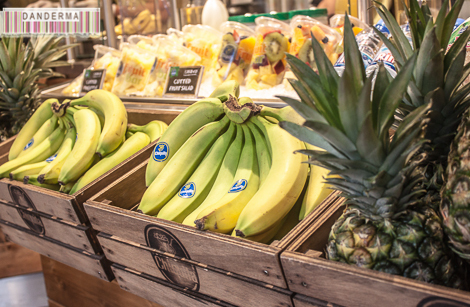 The fruit bar is not very big and can get crowded easily, sporting the Chiquita brand on its wooden fixtures and crates as well as the fruit of course. 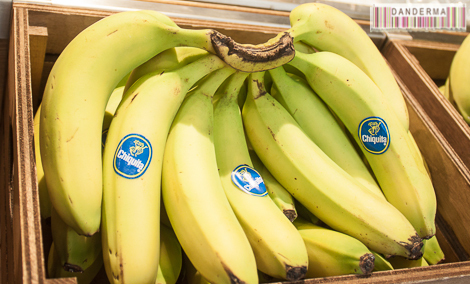 Personally I believe that Chiquita bananas are the best bananas in the world, any other banana brand taste like glue to me for some reason. What do they serve? They have ice creams. 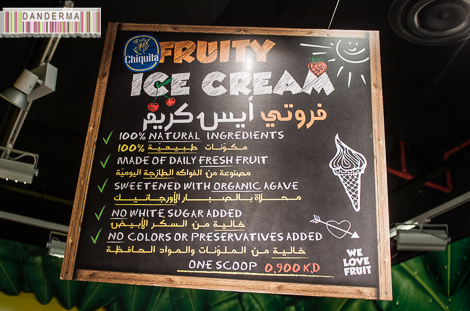 Fresh natural ice creams made daily with fresh fruit and sweetened with organic agave, whatever that ingredient is but I’m guessing its a healthy one sweetener. I can’t remember where I read the name before. 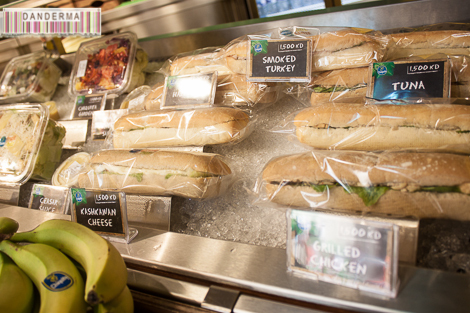 They also have ready sandwiches and salads displayed on ice. 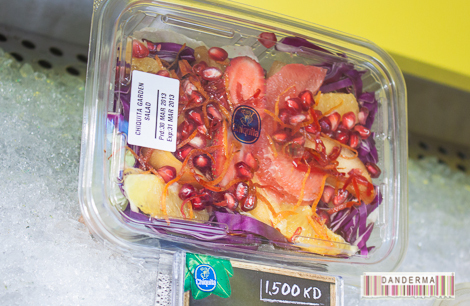 I had my eye on this salad, I love salads with fruits mixed with vegetables as ingredients and this colourful one looked yummy! Next time insha2 Allah. 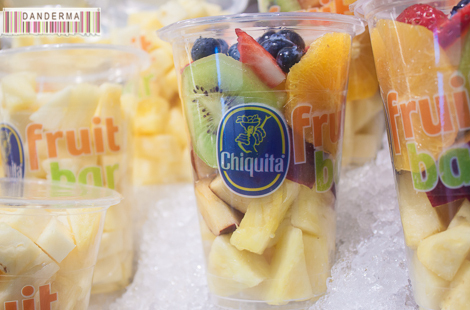 They also have freshly cut fruit cups on ice. I love those! They are very convenient for a quick snack especially when you are shopping and don’t want something heavy and fat laden. 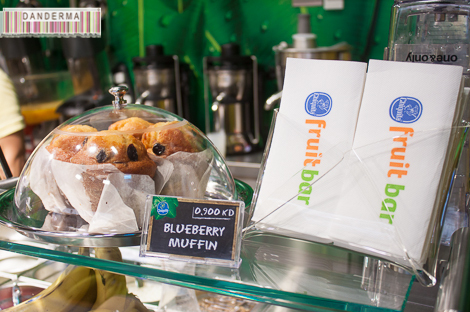 They also have freshly baked muffins. What I wanted to try, however, is their juices and cocktails. 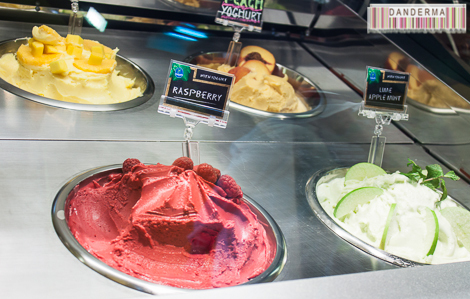 They have plenty to choose from plus a make your own option on the menu. 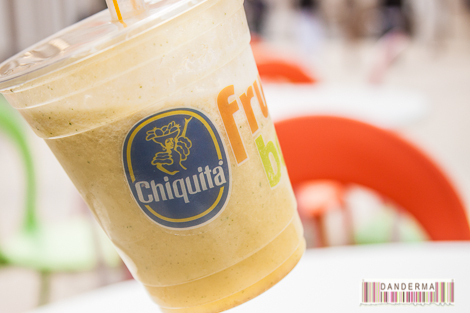 We chose to go with the power smoothies and we selected the small size Flower power. 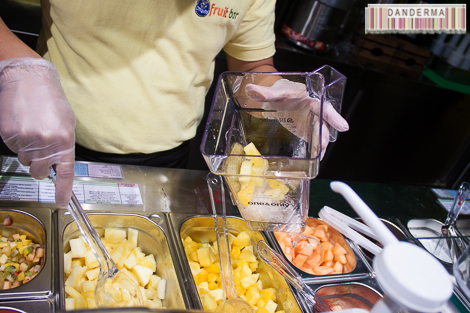 It was papaya with pineapple, mango, and oranges with some green leaves and Acai berry power all blended in. I think the green leaves were rocket leaves. When the juice was done we paid and headed outside at once, it was getting a bit crowded. 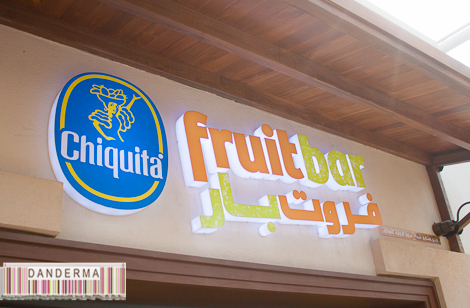 Chiquita fruit bar seating is in the souk walkway with plenty of lighting from the ceiling. 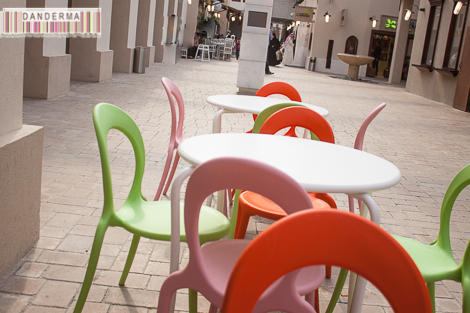 The tables are white and the chairs are bright and colourful. We chose to sit for a minute to taste the juice. I was skeptic regarding its taste to be frank. The How was it? For a booster juice with something green blended in, it tasted very very good! It might not look like it but it was quite good indeed: fresh, sweet, light, and cold. 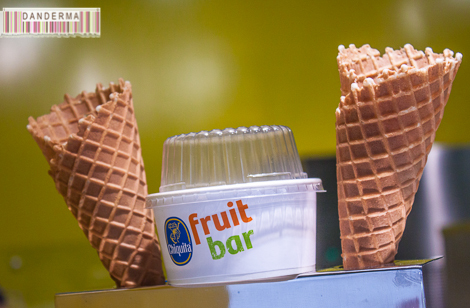 I would have it again for sure for a light dinner or a power booster while I’m shopping around the Avenues mall. Now I want to go back and try the rest of their juice concoctions and their ice cream. 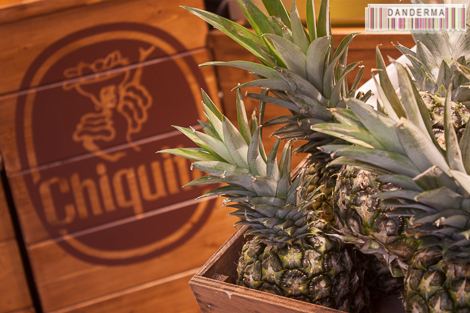 Chiquita fruit bar is located in the Souk district of the Avenues, right beside the entrance from Soku district and at the very end of the corridor where Cafe Bazza is (post) and opposite Capital District store (post). Thank you Damderma for your amazing detailed post. 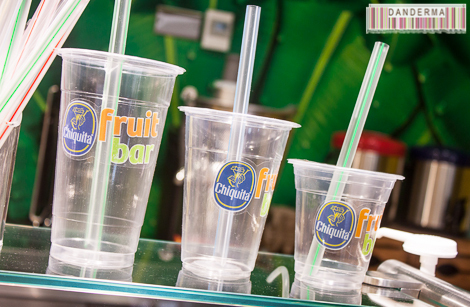 We are very glad that you and other customers as well are falling in love with our 100% fresh natural products. We are also available on fb, twitter and instagram, for all updated and new products. We will be happy to have you in our Grand Opening soon. Thank you again! Btw i caught you taking photos and i was very excited to know who are you. Thank you very much for your kind comments. I tried to find the local social media accounts for Chiquita fruit bar but I couldnt! Wishing you the best of luck and it will be my pleasure to be at your grand opening. 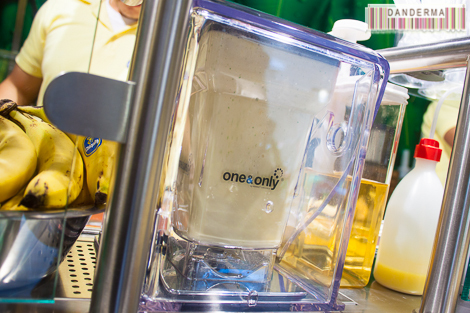 I really, really enjoyed my energy booster smoothie! You are welcomed any time! I’m not affiliated with Chiquita Fruit Bar so I wouldn’t know.